Wohoo!! Ten weeks of Fictional Hotties and the first one of 2011. So who shall it be? Who will kick off 2011 in the best possible way? The answer came to me on NYE, when my Hetero-Life-Partner said that she'd "never, ever, in a million years, NEVER do him." Her firm resolve came as a surprise to me because I find him seriously attractive. To be fair, she was really referring to the actor who plays the character but I think may be one of those he's-like-that-in-real-life kinda deals. This hottie first graced the silver screen as a supporting character. An off-the-wall singer who's first scene has him describing how he's lost a shoe that's the opposite to the one he's holding (but not evil or anything). He prefers to wear dress shirts with as few buttons done up as possible and has an affinity for leather pants, despite vacationing in Hawaii. Long hair manages to make him hotter and his insightfully witty comments leave me gasping for air through choking laughter. Congratulations Alouds Snow, you're #10! (in no particular order). So full of confidence, he says what he thinks with no filter at all. Sure, that sometimes means he doesn't make a lot of sense and is hard to follow, but at the end of the day, at least whatever he's rambling on about is entertaining to listen to. He's wacky, has no shame and sings. What more would you want? 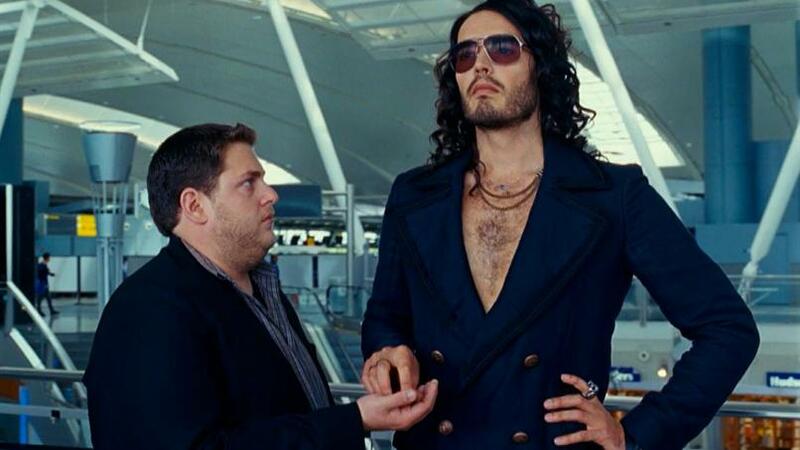 Clearly, there are others out there who agree with me because he made a sequel appearance in "Get Him To The Greek," where he was just as hot and hilarious. Quotes like this sealed the deal with me: "What you did was very spiteful, but it was also very brave and very honest and I respect you for doing that. But the content of what you said has made me hate you. So there's a layer of respect, admittedly, for your truthfulness, but it's peppered with hate. Hateful respect." Seriously, how can you NOT picture what he'd be like in bed? Talk about creative!! He's one bad decision away from becoming a train-wreck but his heart is in the right place. He's a nice guy wrapped up in a funny (slightly drug dependant but still pretty awesome) package. 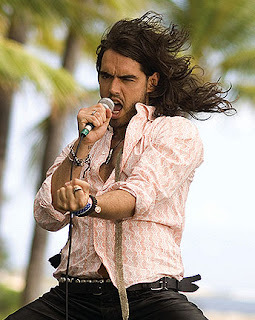 If the real Russell Brand is anything at all like Aldous Snow, that Katy Perry is a lucky gal.